Warming massager by Lover's Choice Inc. This item is totally worth 10 bucks. Maybe not for anything sexual, but it has so many uses and it is easy to care for. It is a must have, especially during the winter, to help you warm up! You and your whole family can use it. Warms up fast. Not too hot, cute, or embarrassing. Can't read the directions due to the color of the liquid. Packaging: Simple cover and slide box. Nothing too sexual on the box besides the name and a picture of what is inside. Packaging is not worth keeping for storage. It is made completely from cardboard. Look and feel of the product: The plastic is nice and smooth. 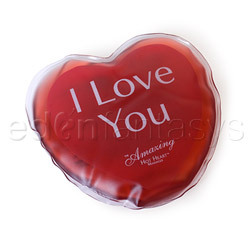 It is made from clear plastic and the liquid inside is colored a deep red. On the massager itself, there are instructions for reuse. The deep red color made the directions hard to read. If it is left out, there is nothing embarrassing printed on it or on the packaging. Sound: When you pop the metal disk, you can hear the reaction going on inside of it, as well as see it. Possible uses: Massages, warming up outside while in the snow or while standing at the bus stop. Warming up in a cold movie theater. Easy to take anywhere. Cleaning and reuse: Boil for 7-10 minutes and then pat dry. If you put lotion or oil on the body during the massage, wipe off with warm water and soap, or with a toy cleaner, before boiling. 1. I do nightly walks. Lately, even with my gloves on, my hands have been getting way too cold and they start to hurt due to arthritis in my joints. So I decided to take it with me on my walk. When my hands started to get cold, I popped the little metal disk inside and rubbed my hands against it. In no time, it warmed up and kept my hands warm during my walk. 2. Massages with this little guy are amazing, It does not get too hot or stay too cold. It is amazing for all type of massages - sexual or for just relaxing. My hubby gave me a very intimate massage with it all over my body. It started off with a simple, "My back hurts," and he then took care of me with a full-on massage. It felt amazing with a little oil or lotion on my skin. I wouldn't suggest warming oil with this product as they may get too hot together. 3. My son is three and we went out on a snow day. After some fun time playing in the snow, we got back in the car and waited for the heater to warm up. As always, my son was complaining he was cold. It was a perfect time to pull the heart out of my purse, pop it, then hand it to him to hold just to warm up. It was prefect! I still love this thing. I am finding so many more uses for it. It's amazing for adults and kids. I just love it, love it, love it! Reviewed by Crimsondevilsin (Eden Advanced reviewer) I am me, and that is who only i can be. Thank you for viewing Hot heart massager I love you – warming massager review page!